Please note that The Forum keeps box office hours and free parking on site for face value tickets Tuesdays through Thursdays, 11am to 7pm. Scion Presents: Slayer, Suicidal Tendencies, & Exodus at The Forum (Inglewood) on November 14th, 2014. This fall, Bay Area thrash legends EXODUS will support fellow metal titans Slayer and Suicidal Tendencies on the Scion-sponsored fall leg of their United States onslaught. The tour begins on November 12th in Oakland, CA at The Fox Theater and will tour throughout the states, coming to close in Detroit, MI at The Fillmore on December 5th. Tickets go on sale to the public this Friday, June 27th at 10:00AM (local time). “This monumental tour is a heavy metal collision of epic proportions! For my first tour back with EXODUS, I’m beyond excited to be on the road with my brothers in true thrash metal! I’m also looking forward to meeting and hanging out with all of the fans on this heavy as hell tour,” states newly returning vocalist Zetro. Due to an overwhelmingly positive response, EXODUS is making VIP experience packages available for the entire tour. Fans are encouraged to get them as soon as possible, as VIP package sales will close seven days prior to each show day. To purchase VIP packages via SLOtix.com – click *here*. Stay tuned for more information on the brand new album from EXODUS, entitled Blood In Blood Out, hitting stores on this fall via Nuclear Blast. If you’ve ever wanted a lesson in true thrash-punk-metal, the wait is over. Bay Area thrash legends EXODUS are proud to announce their participation in this monumental upcoming tour with If you’ve ever wanted a lesson in true thrash-punk-metal, the wait is over. 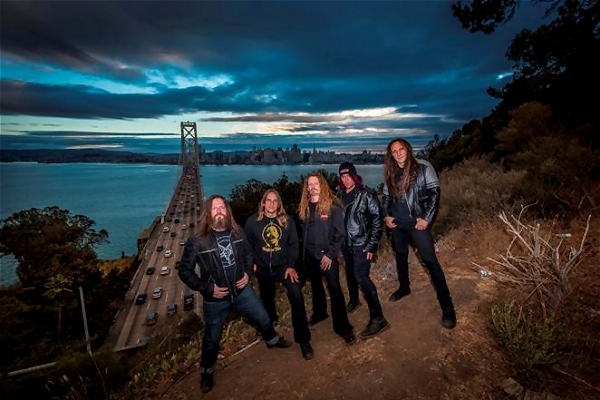 Bay Area thrash legends EXODUS are proud to announce their participation in this monumental upcoming tour with headliners SLAYER and additional special guests SUICIDAL TENDENCIES. This metal-head’s “dream tour” kicks off on May 9th in Salt Lake City, UT, and hits six more cities, including a stop at the world-famous Rock On The Range festival on May 17th in Columbus, OH. Don’t miss all of the moshing, thrashing and headbanging— tickets are on sale as of today! 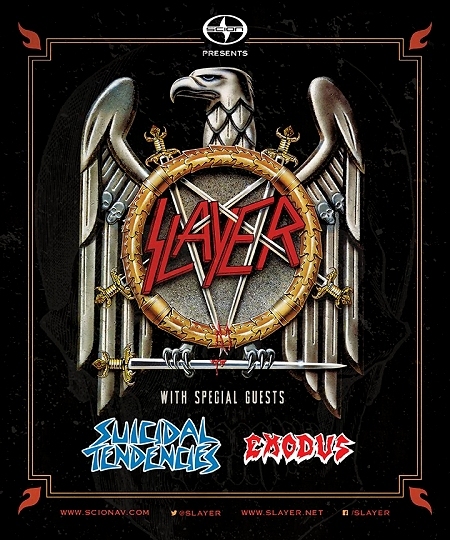 Not only is this one of your first chances to see EXODUS in 2014, but this is the very first time that SLAYER and SUICIDAL TENDENCIES have toured together since the 1990 European “Clash of the Titans” tour. Gary Holt will perform double-duty on this run as guitarist for his band EXODUS, while also filling in for SLAYER’s fallen guitarist Jeff Hanneman. When it comes to thrash metal, Bay Area thrashers EXODUS epitomize, define, raise the bar and have the genre on lockdown. EXODUS are one of the true forefathers of thrash, hailing an illustrious career spanning 34 years. Their 1984 breakout debut, Bonded By Blood, is a stonewall genre classic featuring cranium-crunching standards such as ‘”A Lesson In Violence”, “Strike Of The Beast” and more. Formed in 1980 with original members Kirk Hammett (guitar), Tim Agnello (guitar), Tom Hunting (drums), Carlton Melson (bass), the line-up has evolved through numerous changes before coming to their current status. EXODUS are Gary Holt (guitar), Lee Altus (guitar), Tom Hunting (drums), Jack Gibson (bass), and Rob Dukes (vocals). To date, EXODUS has released ten studio albums, two live albums and one compilation, including their most recent release of 2010’s Exhibit B: The Human Condition via Nuclear Blast Records. EXODUS has sold over 5 Million albums worldwide. 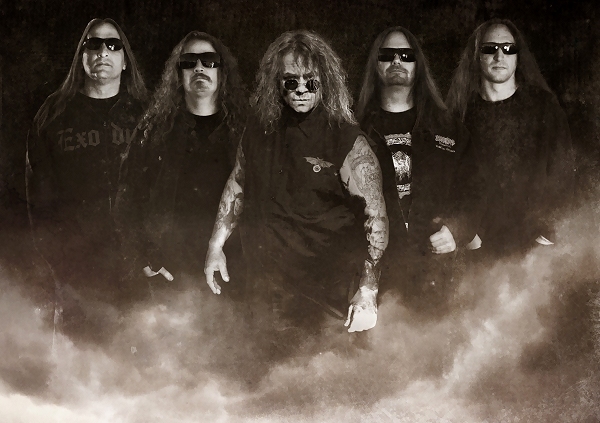 EXODUS recently broke ground on their brand of blistering new material, set for tentative release later in 2014.